Hawks freshman defender Erica Lim avoids a Taft College player in order to try and maintain control of the ball on Nov. 22. Lim was credited with an assist for the first goal of the game by freshman midfielder Kate Burkhardt. 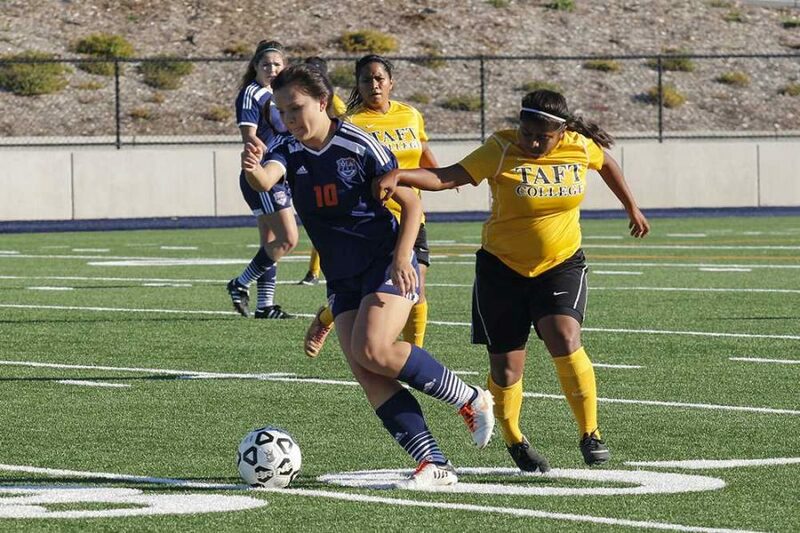 After knocking Folsom Lake College out of the playoffs in round one on Nov. 22, The Cosumnes River College Hawks played host to the Taft College Cougars for the second round of the California Community College Athletic Association 2014 Soccer Regionals on Nov. 25. With the second round, both teams came into the game potentially two wins away from taking part in the 2014 CCCAA State Championship game. The Cougars had the ball first in the early going of the match. At almost Eleven minutes into the first half though, CRC freshman midfielder Kate Burkhardt managed to score the first goal of the match, CRC leading 1-0. The Cougars had an attempt on a goal, but sophomore goalkeeper Anna Brown barely blocked the attempt on the Hawks’ behalf. Later Brown successfully blocked another goal attempt from Taft College. At the end of the first half, the Hawks maintained their 1-0 lead. Freshman forward Nicole Sanchez said that the Hawks played really hard but there were some things that they could have worked on. “After the first half, our coach put it in perspective what we needed to do to really accomplish what we needed to work on,” Sanchez said. A second goal for the Hawks was made by freshman forward Kelsey Jantzen at 52:13 minutes of play. It took no time at all for the Hawks to score a second goal, as at 52:56 minutes of play sophomore defender Allison Krebs gave CRC a 3-0 lead. Krebs shot would be the last goal scored by the Hawks, not for a lack of trying though. 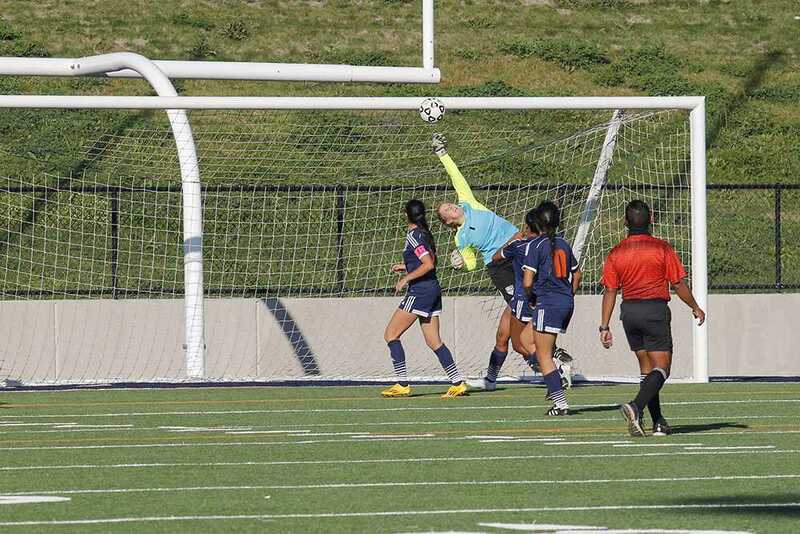 Burkhardt had an attempt on a goal but inadvertently kicked the ball into the stomach of Taft College freshman goalkeeper Arielle Stoyanow. Stoyanow continued to play after the hit. CRC had another attempt on a goal with when freshman defender Erica Lim kicked a ball that ended up sailing right past the Taft College goal post. The shutout game came to an end at 65:38 minutes of play when Taft College sophomore Cristina Salazar brought the Cougars their first goal, bringing the score to 3-1. In the last twenty minutes of play, Hawks sophomore goalkeeper Anna Brown managed to block another attempted goal from the Cougars. Afterwards, Brown had to be attended to, including drinking water, so that she could continue to play. 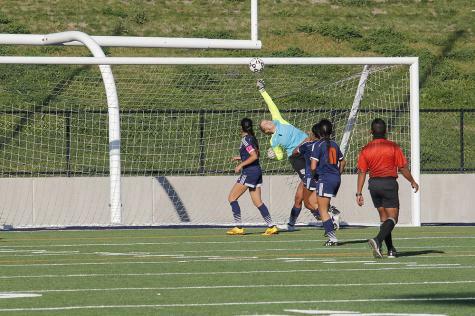 Sophomore goalkeeper Anna Brown leaps high to block one of the many attempted goals from the Taft College Cougars. The last few minutes of play were a fevered passing match between members of both teams as they attempted several unsuccessful shots for goals. The final score was 3-1, allowing the Hawks to advance into the quarter-finals. Hawks’ head coach Cesar Plasencia said that the result was a big win for them and said he thought they were the much better team and the score reflected on that. Plasencia said that they could have done better as they weren’t good with possession and their combination of play wasn’t sharp, but they battled and worked hard, and they earned their victory. Sophomore defender Kori Martin said that the result of the game was good and that everything that they had practiced throughout the season really showed. She said that the Hawks advancing into the quarter-finals is well deserved. Modesto Junior College will be the team the Hawks face in the quarter-finals, in Modesto on Nov. 29 at 2 p.m.
Sanchez said that while the result of the match was well-deserved and the Hawks played really hard as a team, they could have done better. She said the quarter-finals is going to be tough but is confident about it. “It’s going to be tough, but I think we are more than ready for it and we made this far, so we are really excited about it,” Sanchez said.